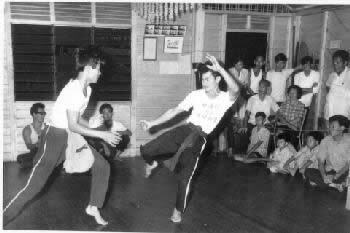 An invaluable old picture taken about 30 years ago showing Poh Luk and Ah Kai (both are Sifu Wong’s senior classmates) engaged in an annual grand free sparring competition in Sifu Ho Fatt Nam’s Shaolin school. Notice that the combatants did not wear any protective gears and they used typical Shaolin Kungfu. There were no rules and no referees. The combatants just fought, but usually there were no injuries because the combatants could defend themselves well, and on infrequent occasions when they couldn’t, the opponents would control their strikes expertly. Such an annual grand free sparring competition amongst classmates followed the old tradition of the southern Shaolin Monastery in China. Finally we spar using gloves for about 30 minutes. Not a single kungfu master in the past used gloves for sparring. Indeed I believe that any instructor asking his students to use gloves, himself has had no experience of genuine kungfu sparring. Using gloves to spar, especially without methodical preparation, almost always results in the students resorting to boxing or kick-boxing techniques. I just hate sparring. I feel like a living punch bag. When I spar with senior students I am helpless; I can hardly touch them. Your case, which is also the case of the majority of kungfu students today, is unfortunate. Sparring is an essential, and actually a lively and enjoyable, part of kungfu training. It is often in sparring, pre-arranged or free, that the beauty and efficiency of kungfu is brought to life. Something is basically wrong if anyone becomes a living punch bag in sparring, in which case it ceases to be sparring, it has become a free exchange of kicks and blows. In traditional kungfu sparring, including free sparring, no one should be hurt. In the past, even free sparring was carried out with weapons; hurting one another was out of the question. Our teacher tells us to try to use the techniques that we have learned and to attack. But till now it is merely exchanging blows and doing chain punches. I try to be relaxed and to use the techniques and to stay in my stance but everything just goes too fast. The teacher did not have proper training in kungfu sparring when he was a student, otherwise he would not merely ask his students to try to use their techniques, he would instead actually and systematically teach them how to use the techniques. Let us take an analogy. Suppose you are a properly trained swimming instructor. You would first teach your students the appropriate swimming techniques. Next you would have them practise the techniques systematically, first with full control, then as they progress you would gradually release the control. Only when they are competent you would allow them to swim, but still under close supervision and relevant correction whenever they make mistakes. You do not simply throw your students into water and ask them to try to swim. Sometimes I try to defend only but I can’t deflect anything,. I’m too slow. I have been sparring since the first lesson. This is because you have not been properly trained. Asking a kungfu student to free spar in his first lesson is like throwing a beginner into deep water in his first swimming lesson and asking him to try to swim. There are many types of sparring, and I reckon that here you are referring to free sparring. In traditional kungfu training, free sparring comes at the end of combat training, and not at the start. Free sparring is not meant to teach fighting, as many modern instructors mistakenly think; it is meant to test and confirm that the students can fight. And they can fight effectively only if they have been systematically trained to do so. Sparring is found in all styles of kungfu, including Taijiquan of course. Goh from Singapore practiced sparring with Geoffrey from England at an Intensive Taijiquan Course in Malaysia in September 2004. Most other students seem to enjoy the sparring. I have talked to senior students about it. They say it is normal to get a lot of hits in the beginning, sparring is to develop stamina, sparring is a way to see if the techniques work. You must learn to accept hits and learn how to really hit instead of merely touching a person. It is not normal to be hit, not even once. That is the fundamental purpose of combat training. Should this happen in the past, especially when sparring with weapons, the students would have been killed many times over. If in your sparring practice you are hit, it is accidental, not normal, and it indicates that you have failed in your purpose. Sparring may develop stamina, but that is not its main purpose. There are other and better methods to develop stamina. Sparring is not a way to see if the techniques work. In the first place, there is no questions about whether the techniques work. If there is any doubt, that technique should be discarded. Only techniques that have proven to work well are selected and practised, and in any particular combat situation the best one amongst the many available proven techniques is applied. In combat there is no room for chance; the combatant has to be 100% sure. If in real combat or free sparring, a combatant is hit, it is not because his chosen technique cannot work, but because he lacks the appropriate skills to use the technique effectively. The fact that he chose the technique means not only it can work but it is the best for that particular situation. If he does not know which technique to use, then he should not be sparring in the first place. He is simply not prepared; he should go back to earlier stages of pre-arranged sparring. Accepting hits and really hitting others may be normal in a brawl, but certainly not normal in traditional kungfu sparring. A kungfu exponent is expected to effectively defend against all hits, and if during sparring practice his partner could not defend against his attacks, he should merely touch his partner and not actually hitting. Even in a real fight, he should avoid hurting an opponent unnecessarily. 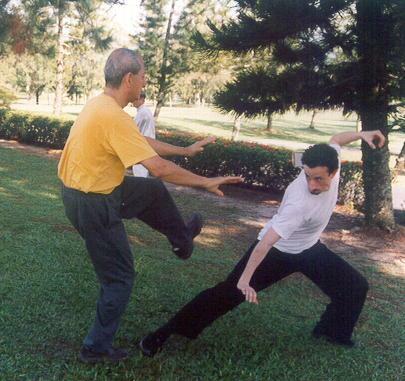 This is known in kungfu culture as “dim tou wai chi” (in Cantonese). It means in sparring or a real fight, you merely touch your partner or opponent, not really hurting him. In the past when a master touched another master in a match, the latter would withdraw and gracefully acknowledge defeat. Sometimes he might kneel down and prostrate, and thanked the victorious master for sparring his life — in Cantonese it would sound something like: thor cheah si fu sau ha lau cheng, which means “Thank you, master, for showing mercy under your hands.” This is traditional kungfu culture. Continuing to brutally strike a helpless opponent, and proudly demonstrating to a maddening crowd how merciless he is, is a culture of barbarians. There was no need for a master to strike hard to demonstrate his force. It was common knowledge that every master would have trained to be so powerful that he could kill or maim with just one strike. Kungfu in the past mainly involved force training, not learning flowery movements for demonstration as is the norm today. That one touch was not connected randomly, it always aimed at a vital spot. If a forceful strike on a vital spot could not put an opponent out of action, it would at least daze him momentarily, which would be sufficient for the master to follow up instantly and from close quarters a second and a third strike on the same vital spot. The way you have been practising your haphazard sparring not only will not improve your kungfu skills, but it is actually detrimental to your development. You are actually conditioning yourself to take unnecessary punishment which may lead to serious injury, and learning to be insensitive, brutal and aggressive which is bad for your psyche. Besides unarmed sparring, there is also sparring with weapons. Indeed sparring with weapons was more important in the past than unarmed sparring. 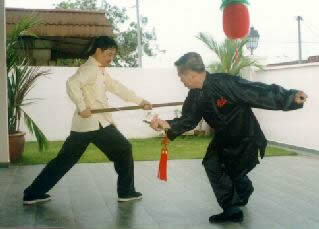 Here Sifu Wong demonstrates an application of the Shaolin sword against a sweeping staff attack from his senior disciple, Goh Kok Hin, during a sparring practice. My teacher says our sparring is very light compared to other martial arts like kickboxing. This way of training feels like the hard way to learn self-defence. I have read your book “The Art of Shaolin Kung Fu” and I think the Shaolin training methods that you describe are a lot more advanced. Your teacher has confused brawling with sparring. Kungfu sparring is elegant and safe, but can be very destructive if needed be — more destructive than other martial arts, including kickboxing. Though it is far from pleasant, an able-bodied adult may stand a few kicks from a kickboxer, but he would not last one strike to his eyes or groin from a kungfu exponent. There is no self-defence in the way of training you have described. It is merely a matter of enduring your partner’s strikes while striking hard at your partner at the same time. I do not consider it the “hard” way, in the sense that though the training is tough it brings benefits eventually. I consider it silly; I really cannot think of any reasons why one should subject himself to such punishment, and with no benefits in sight. If he wants to let off stream, he might do kendo; if he wants to be a fierce fighter, he might do Muai Thai Boxing. When I go home after training I feel frustrated. I can’t stop thinking what I’ve done wrong and how to improve my fighting. You haven’t done anything wrong in your training; it is the training that is wrong. Hence, you got the results the training gave because you carried out your training correctly. Obviously what you need is to change to another type of training which enables you to be combat efficient without having to suffer injuries, and to be calm and fresh instead of being tensed and tired. All genuine kungfu training gives such results — in practical terms, not just in writing. When I feel frustrated I read your webpages or books. They give me inspiration to continue my practise. But after the last training my head ached and it seemed like a sign to quit. I am glad you have derived inspiration from my books and webpages. I wish to stress that what I have written in my books and webpages are true, and is written from direct experience. Someone practising the ways I have described will get the results as promised. You can verify this by reading the comments my students have written , and although other people may regard such experiences as exceptional, they are actually typical of what my students have. In other words, almost everyone who learned from me have had similar experiences. But you have to learn directly from me. It is difficult to have similar experiences by learning from my books, otherwise you too would have those wonderful results. It is not that I have kept some secrets from my books. In fact one would get much more information from my books than from learning personally from me. The reason is that those wonderful results are obtained from developing skills, and not just from gathering knowledge, and while knowledge can be gathered from books, skills need to be acquired from a master. For the past few months I am thinking of quitting Wing Chun. I know I will get better when I continue training but I don’t know if it’s worth it any more. Quitting feels like a personal defeat and I think the best of Wing Chun has yet to come. Is it too early to quit? Sifu, could you please give me some advice. Often it is not what you learn, but how you learn it that is more important. If you learn Wing Chun the way it was taught by traditional masters, you would have good results. But the ways you described in your training are not the ways the traditional masters taught it. If you continue hurting yourself in your training, physically as well as psychically, the worst, not the best, has yet to come. In such a situation, quitting is certainly not a personally defeat. On the contrary, it represents a realization that you have been on a wrong path, and now you want to change for a right one. It needs courage and determination to change. 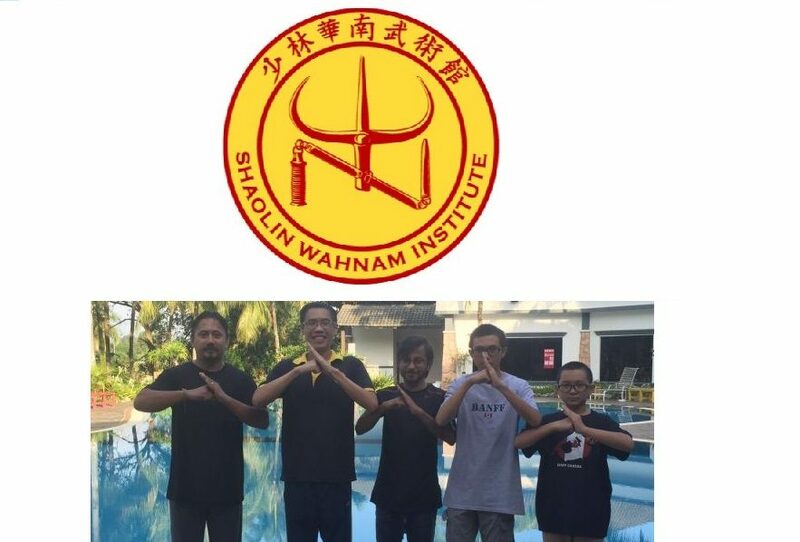 This entry was posted in Grandmaster Wong Kiew Kit, Kung Fu, Shaolin, Shaolin Wahnam, sparring and tagged Grandmaster Wong Kiew Kit, Kung Fu, Shaolin, Shaolin Wahnam, sparring on July 1, 2015 by Wei Joo Lee.